Appearance: Tubby and appealing in the way that pit bulls are. 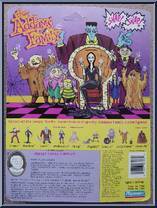 Only eleven years old, but has his Uncle Festers's frenzied eyes (which Fester wants back). Usually accompanied by his pet squid, Wallace. Hobbies: Experimenting with his mad scientist lab, exploring places too gross and scary for average kids. Helping his uncle blow up a wide variety of objects. Quote: "It's just not fair. I get crushed, trampled; why should I have all the fun?" 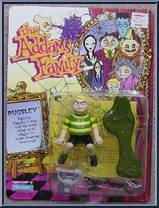 Personality: Pugsley is the Addam Family's not-so-little rascal. He leads the kind of gleefully tormented life of which normal little boys don't even dare to dream. Like all great Addams men, Pugsley's greatest thrills come from being a constant and bizarre troublemaker. But deep down, Pugsley is too good to actually hurt anyone. He's much happier just sending his victims running away, screaming in terror. Not the brightest boy you'll meet, Pugsley makes up in courage what he lacks in brains. He fears nothing, and will climb into any dark hole, challenge any type of beast, and put anything in his mouth. Contribute pictures, update details or suggest corrections for Pugsley. Write a review about Pugsley.